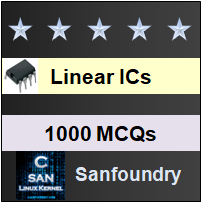 This set of Linear Integrated Circuit Multiple Choice Questions & Answers (MCQs) focuses on “High Speed & Precision Type Comparator”. Explanation: The special designed comparator outperforms the op-amp type. They are optimized for the most desirable promoters like speed and accuracy. So, their output is compatible with RTL, DTL, TTL and MOS Logic. Explanation: The response time of the comparator is the interval between the application of an input step function and the time output crosses the logic threshold voltage. Explanation: The negative output level or output low voltage is the negative dc output voltage with comparator saturated by a differential input equal to or greater than specified voltage. Explanation: The strobe current is the current out of the strobe terminal when it is of the zero logic current. Explanation: The strobe release time is the time required for the output to rise to the logic threshold voltage after the strobe terminal has been driven from zero to the one logic level. 6. Which of the following comparator can operate from ±15 to down to +5v supply in op-amp? Explanation: µA311 precision comparator is designed for low level signal detection and high level output drive capability. So, it can operate from ±15v op-amp supplies down to the logic +5v supply used for IC logic. Explanation: LM1414 has slow response time typically of 30ns, where µAF311 & ICL800 has response time of 200ns and 250ns. 8. Why ICL8001 op-amp comparator is preferred for most applications? Explanation: The important feature of ICL8001 is low power consumption. It consume power in the range of 30mw. 9. Which op-amp is preferred for application like high speed A-D converter and zero crossing detector. Explanation: µA670 is a high speed differential voltage comparator with complementary TTL output. It has typical response time of 16ns and operates from supplies of ±4.5v – ± 6.5v.